Is data different from information? This is a great question to ask if you want to start a flame war amongst the data management (or should that be information management) community. My post Data vs Information ran for months in various data management forums without resolution. Recently, there have been a number of posts looking at the difference between the two terms. In Practical Magic: Part 1, John O’ Gorman looks at this issue. He suggests that data and information are not the same. Using a definition derived from Dr Barry Devlin’s book, Business unIntelligence, John proposes that “Data is technically enhanced Information which means that information comes before data”. This definition creates a foundation for Enterprise Information Management (EIM) as it creates separation between the logical and the physical representation of data/information. The definition proposes that information has a natural architecture, while data has been adapted/translated to fit into available technical stores, such as a database. By implication, data is somehow less natural and may loose meaning in translation. 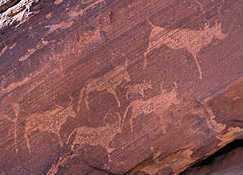 San rock art, for example, is thought to be a technical representation (data) of a shamanistic vision (information) that may have guided the San in their hunts, or had a religious significance. Organsations that can separate the two and minimise the loss will have a better representation of reality and, therefore, better quality data. The other common definition implies that data is simply information in raw or unorganised form. Add context, and you have information. By this definition, data comes before information. By this defintion, poor quality data leads to poor quality information. Disciplines such as Data Governance and Metadata Management add context to data – turning it into information. Whether we prefer the first or second definition they have one thing in common: Data and information are defined in reference to each other. By the first definition we cannot have data without information, by the second we cannot have information without data. 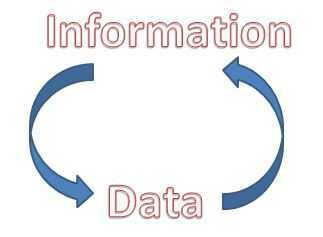 This circular reference shows that information and data, while different, are also the same. Poor quality data leads to poor quality information. Data governance turns data into information. Data management is not inferior to information management. And the Chief Data Officer has a different role to the Chief Information Officer. In a business context the terms are frequently used interchangeably, and rightly so. Which term gets more attention from your business users?